Usman W. Chohan has an MBA from McGill University in Global Strategy and Leadership (2014). He has served as a consultant at the World Bank Institute (WBI) and as Special Situations Analyst in the Global Equities team at Natcan Investment Management. 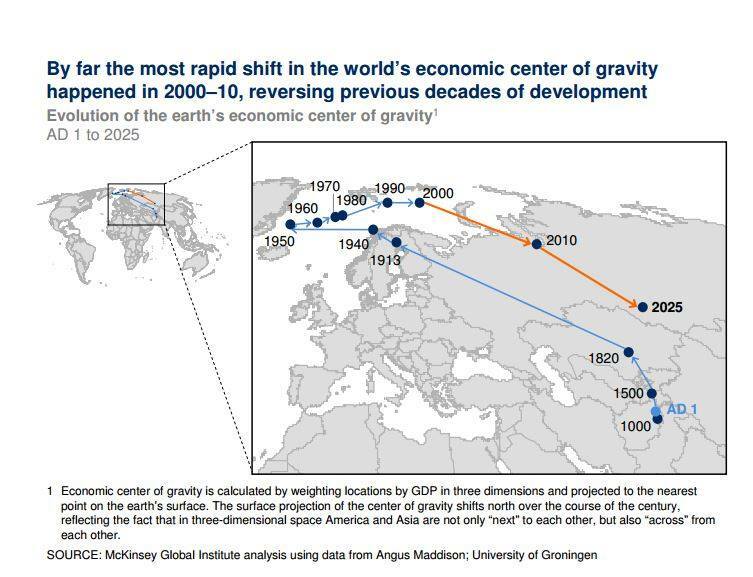 Recent analysis by the McKinsey Global Institute (MGI) has examined the theme of the Economic Center of Gravity of the world, thereby identifying where the weight-adjusted center of global GDP would have historically been marked as a cartographic point. This exercise helps to identify the transition over the past 2000 years of economic activity, and its trend towards Europe during the Industrial Revolution, followed a rapid reversion towards Central Asia in the 21st century. The illustrative message is that the rise of Asian emerging markets is shifting the weight of global GDP back to Asia, and very rapidly so. However, there are some fascinating finer points to be gleaned from this analysis, among which both the initial start date of the analysis at AD 1 as well as the following data point at AD 1000, merit a closer look. Applying modern borders for context, MGI’s analysis shows that, for the thousand years following Anno Domini, the center of economic gravity for the world was in Pakistan, at its Afghan border. This is a somewhat surprising and fascinating observation about the weight-adjusted GDP of the world, that Pakistan should occupy such a central location for so long a duration. But it is not in turning to antiquity that the greatest value of the economic context is gleaned. Rather, it is in drawing inferences for the future that understanding the economic center of gravity bears the greatest dividends. In fact, it is at the crossroads of economic cartography and geostrategic thought that we draw a most interesting inference about a reversion towards the vicinity of Pakistan as the global center of economic gravity, and this is because the geostrategic location of countries can and does play an indisputably essential role in their approach to economic development, political design, and international relations. Certain countries possess a geostrategic dividend that arises from their position at the crossroads of two or more large economic blocks or entities. In the case of Pakistan, it has been long recognized that it is centrally positioned between several large economic entities, namely China, South Asia (SAARC member countries), Gulf states (the GCC countries), and Central Asia (the CIS republics). In aggregate, these regions account for roughly half of the world population and a rate of economic output growth that exceeds the mean growth of of the rest of the world. Pakistan has long highlighted its geostrategic paradigm as a crossroads between these regional blocks, and it is in the very recent past that a meaningful capitalization of this phenomenon has emerged. In the past month, Chinese leader Xi Jinping arrived in Pakistan on a two-day tour that included, among other variables, a commitment to infrastructure investment in the Pakistan in a mammoth deal that is estimated to exceed $45 Billion. In addition to a long cherished and all-weather friendship between the two countries, known as Quantianhou Pengyou (全天候朋友), geostrategic considerations have played an important role in the design of this project, broadly termed the China-Pakistan Economic Corridor (中国巴基斯坦经济走廊). There are far too many broad benefits from this megaproject, but a few deserve specific mention. The corridor will dramatically reduce the transport time of goods and resources between China and the Middle East, as well as foster the growth of the western half of China, which has historically lagged the more dynamic and coastal east. It will also open up transit opportunities for economic output to and from Central Asian republics and an Afghanistan recovering from decades of strife. It will also create a manufacturing hub in the newly built deep-water port of Gwadar in Western Pakistan. What can be gleaned from the modern geostrategic variables that drive an almost $50 billion infrastructure plan and the fascinating MGI analysis on the historical economic center of gravity of the world is that both speak to the durability of geostrategic thought as a prism for the contextualization of global economic development. The center of gravity is reverting, at break-neck speed, towards its long-term position, closer towards Pakistan, a country with a widely-recognized geostrategic dividend to reap. Capitalizing on that dividend, in turn, creates very positive second-order effects for all neighboring countries, which can then leverage the economic facilitation of better networks towards their cost-structures, including transportation costs and energy procurement costs. There is, in short, a sense of historicity in the geostrategic analysis of global economic progress that helps to inform future economic transformations. As the eulogy to the Tang dynasty Chancellor Wei Zheng remarked, we can use history as a mirror.